30 Missions. 10 Men. 1 Crew. July 31, 1944. A B-24 Liberator bomber nicknamed The Irishman's Shanty returns safely to her home base at North Pickenham, East Anglia, England. Inside she carried the jubilant O'Sullivan Crew 713. These men had just become the first crew from the 492nd Bomb Group (H) to complete a 30 mission combat tour. 7 days later on August 7th, 1944 the 492nd Bomb Group was removed from combat status. The 492nd suffered staggering losses. Several tough missions and old fashioned bad luck combined to plague the group beginning with their first mission on May 11, 1944. The group as an active combat participant was only in action 89 days... less than 3 months. Of the original 71 crews who arrived at North Pickenham in April of 1944, only 36 crews remained 3 months later. To this day the 492nd stands alone as the only heavy American bombardment group to be removed from combat during WWII, and remains the only heavy bomb group removed from combat in the proud history of the United States Air Force due to high losses. 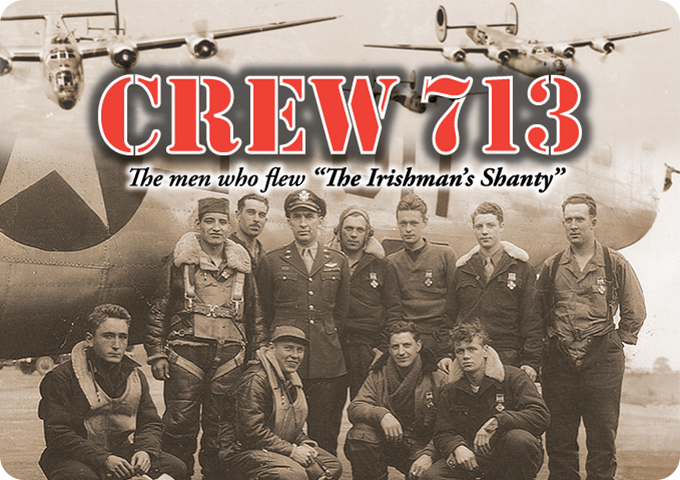 Crew 713 tells the story of this historic, and yes, lucky crew. The tale of O'Sullivan's Iron Men and the sad, short and violent history of the 492nd Bomb Group are forever entwined. Crew 713 returns us to the days when massive air armadas went forth to do battle with an implacable foe over the dark skies of Occupied Europe. It is the history of the most mass produced American military aircraft of all time; the Consolidated Manufacturing B-24 Liberator bomber, and the men who flew them through tremendous hardships. Crew 713 is a story of grim determination and the triumph of the human spirit. Utilizing animation, pristine archival footage, graphics and contemporary music, Crew 713 is a modern approach to the tired WWII documentary genre. Crew 713 is the story of one crew. But it is the shared history of every crew who flew the Liberators, Fortresses, Mitchells, Marauders and the fighter groups that escorted them over Europe, Italy, North Africa, the Far East and the vast waters of the Pacific. Crew 713 is a production of Shanty Films LLC in cooperation with Dancing Fish Productions. Produced by Fiona Hall. Directed by Alejandro Mena.